From the moment you walk through the double stained glass entry doors you will be wowed!!! 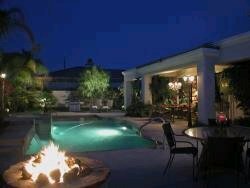 This extremely well appointed comfortable high-tech, state-of-the-art home in a classy gated community in prestigious Rancho Mirage has everything for your dream vacation. There is a computer and printer for your use plus high speed DSL and WI-FI, plus unlimited local and long distance calling. This very upscale home is well suited for a corporate retreat, professional couple or mature family who are looking to get away from it all and relax in a serene ambiance. This home is definitely NOT recommended for loud parties or families with small children who need and like to play hard and loud. 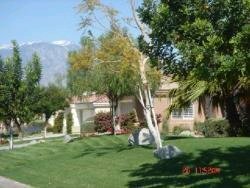 This upscale private gated development is extremely quiet and reserved, yet close to the River and El Paseo. The pool side living room wall completely opens out onto a fabulous pool with waterfalls and also majestic mountain views, plus there is a beach pool for soaking in the sun. There is also a fire pit and extra large barbeque for outdoor eating and cozy evenings. There is a separate high jet therapy spa which s heated 24/7. Also in the living room is a dining table for 10 plus a fireplace and a 52� flat wide screen TV plus DVD/DVR and stereo. Bose speakers are throughout the home also for piped music. The kitchen is a gourmet cooks dream with a 42� stainless steel five-burner stove with a two-drawer Fischer and Paykel stainless dishwasher and stainless trash compactor. The gourmet slab granite island measures 10 feet by 5 feet, and has a double stainless sink. Reed glass cabinets with indiscrete lighting inside and also subdued lighting above the crown moldings make for the perfect setting for an elegant dinner party or romantic fireside dinner. There is a great chandelier and is perfect for entertaining. Also there is a 22� plasma TV built into the cabinets. There is a breakfast morning area and a table which at night converts to a games table with poker and blackjack covers. There is a library with hundreds of books ,tapes and DVDs plus many board games and playing cards with a card shuffler and poker chips for your enjoyment. There is a full-size washer and dryer along with an ironing board and iron. And the cr�me de la cr�me here is a movie ttheater- yes a private movie theater with amazing sound. Complete with reclining theater chairs! Bedrooms are 4 and there are 2 with bath tubs. Beds are king/queen/queen and 2 twins. Plus there is also a full size rollaway for an extra guest. All beds are of the highest quality double pillow tops, with beautiful linens from Europe. That's a total of 6 separate beds. This charming home is a classic case of �Quality vs Quantity�. It is a private get-away for seclusion and tranquility, close enough to all of the golf, shopping and restaurants that you can endure, but a peaceful retreat come evening to sip champagne by the outdoor fire, swim or just relax in the jacuzzi under the stars. 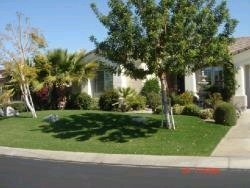 NOTE: Home is within walking distance of the Temple.and Bristol farms and many shops and restaurants.